Show off your smile while you're straightening your teeth. Are you hiding your smile? Perhaps you've thought about orthodontic treatment, but you're worried about how you'll look with braces. 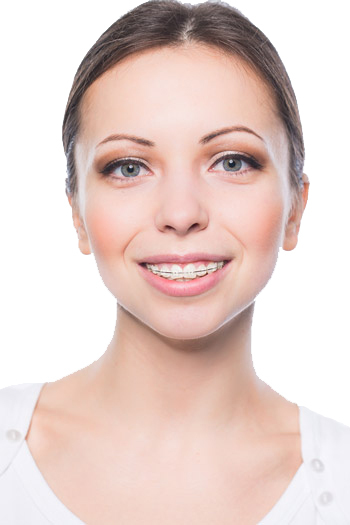 Never fear, we have terrific options that are less visible than traditional braces. Problem solved! Teeth are gradually moved using a series of clear aligner trays. Generally, this requires fewer office visits than traditional braces (up to 3 months between visits). This type of orthodontic treatment is not suitable for every patient. Come see us for a free comprehensive evaluation by one of our Orthodontic Specialists to see if it's right for you. Why get your clear aligners from Dana Orthodontics? You will get a competitive price, plus professional, local care from an Orthodontic Specialist. Restrictions apply. No additional promotions or discounts can be applied to the purchase of clear aligner treatment. This type of orthodontic treatment is not appropriate for all patients. To learn more about how clear aligners work, please feel free to visit Clear Correct. There is another option if aligners are not right for your needs. The brackets are ceramic and are designed to blend in. They are much less noticeable than traditional brackets. We'll be happy to discuss the best options for you during a free orthodontic consultation. Give us a call and let's get that beautiful smile out of hiding.